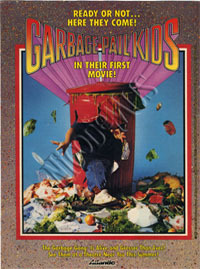 Seriously - there are some BAD reviews out there! 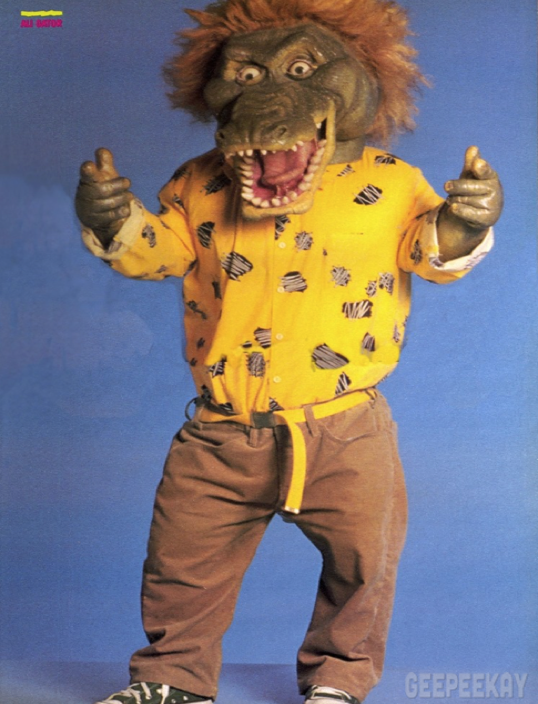 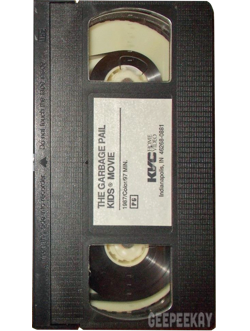 Regardless, it was made…and now it can live on forever! 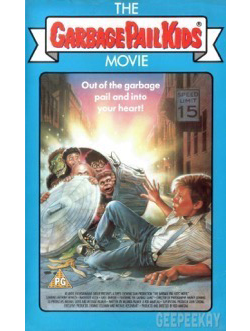 After its theatrical run, it was later released on Home Video in both BetaMax and VHS format, and eventually re-released on DVD and BluRay. 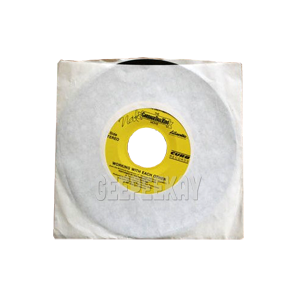 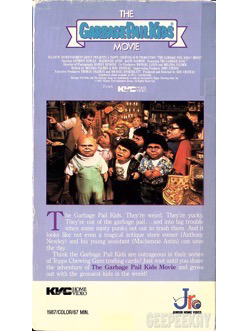 The movie soundtrack, released by Curb Records in 1987, includes all of the songs from the film, including the kids’ production number “(We Can Do Anything By) Working With Each Other”. 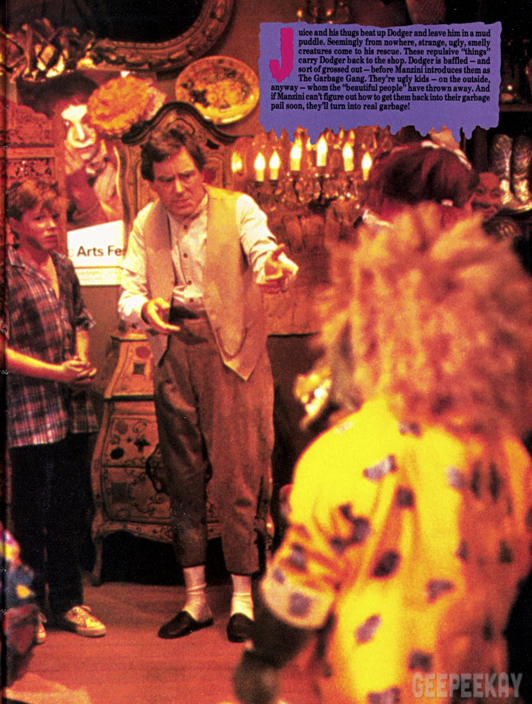 It does not, however, include any of the Original Score work by Michael Lloyd. 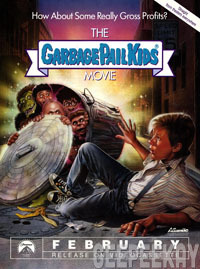 The Soundtrack was available on 12” LP, containing the original poster artwork on the front, and some trading-card-styled character images on the back of the album. 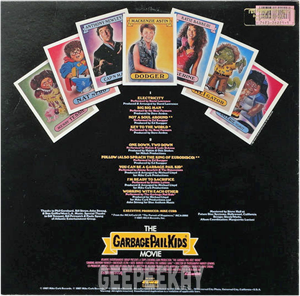 A promotional 45 single was also issued featuring "Working With Each Other" and "You Can Be a Garbage Pail Kid." 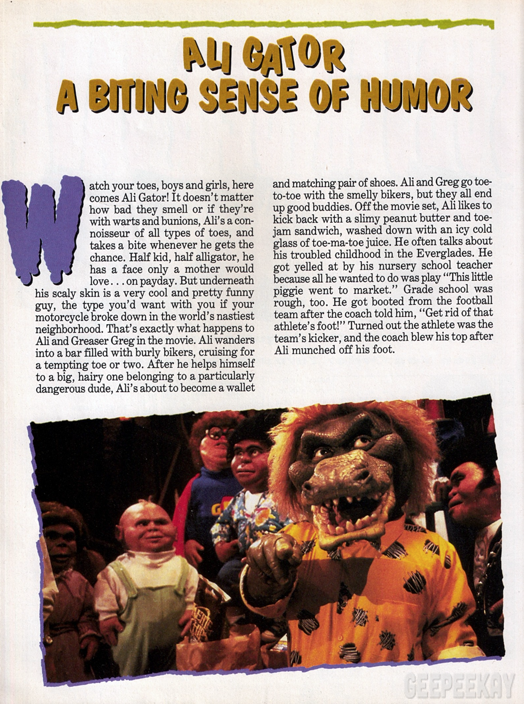 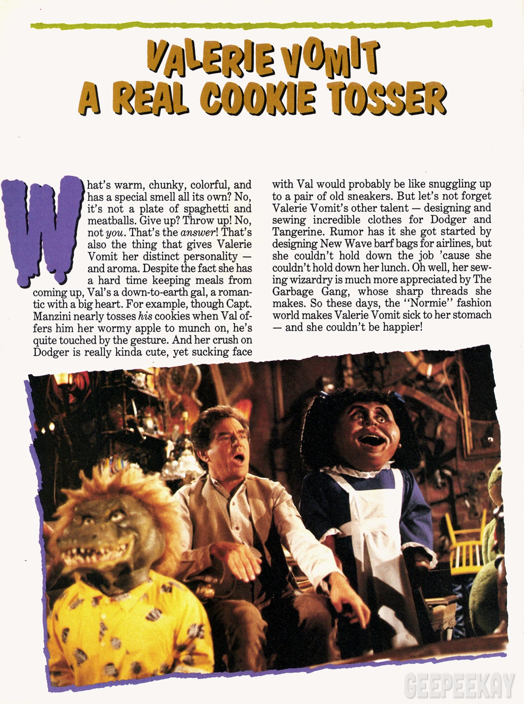 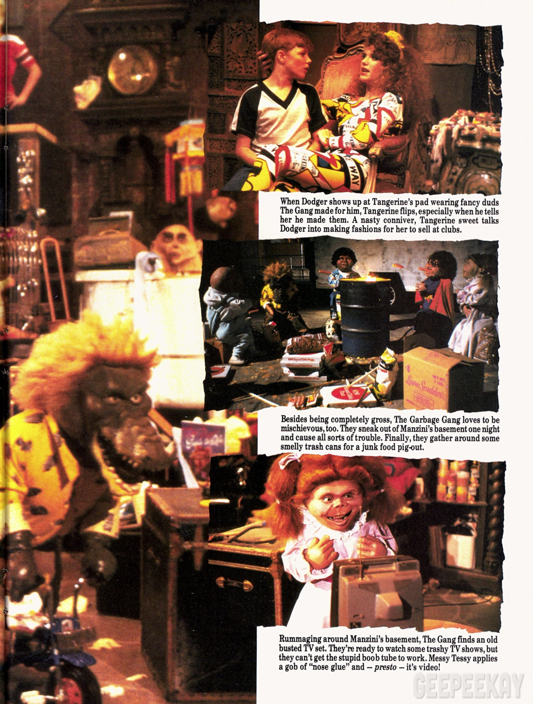 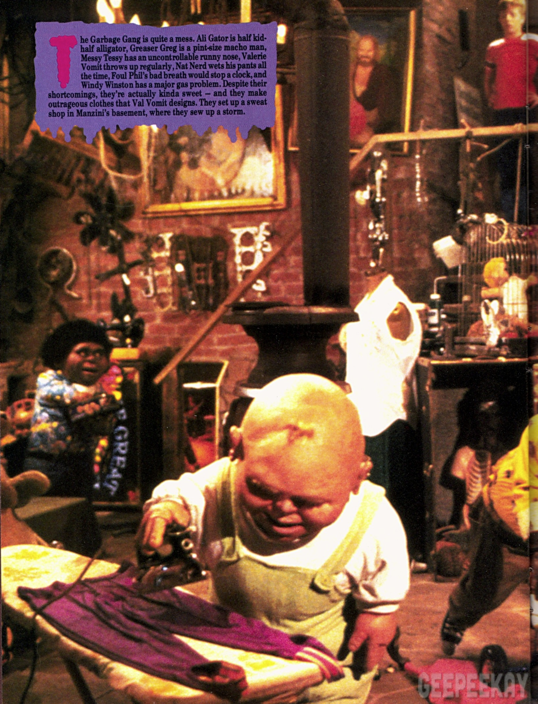 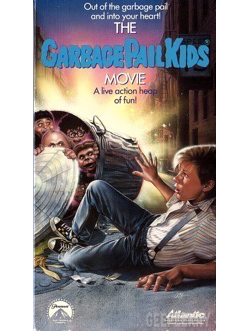 A 'Movie Press Kit' was prepared for the Garbage Pail Kids Movie, and it was put together pretty well (considering what a mess the movie ended up being). 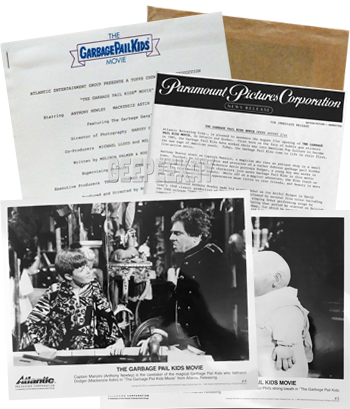 Enclosed in a nice folder (featuring the Movie Poster on the cover) was a copy of the original script, an official "News Release" from the Paramount Picture Corporation, and a thin brown paper envelope containing eight 8x10 glossy B&W photos. 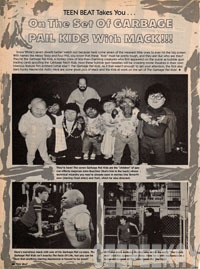 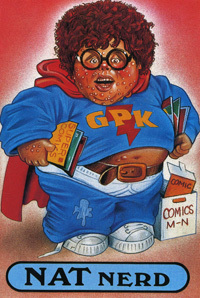 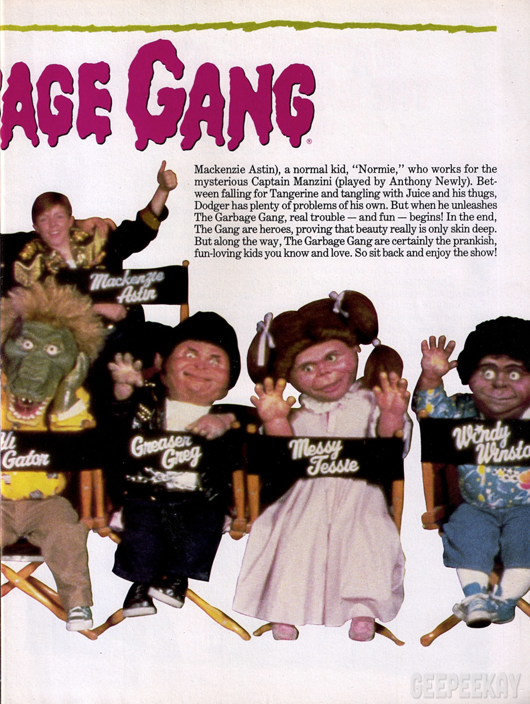 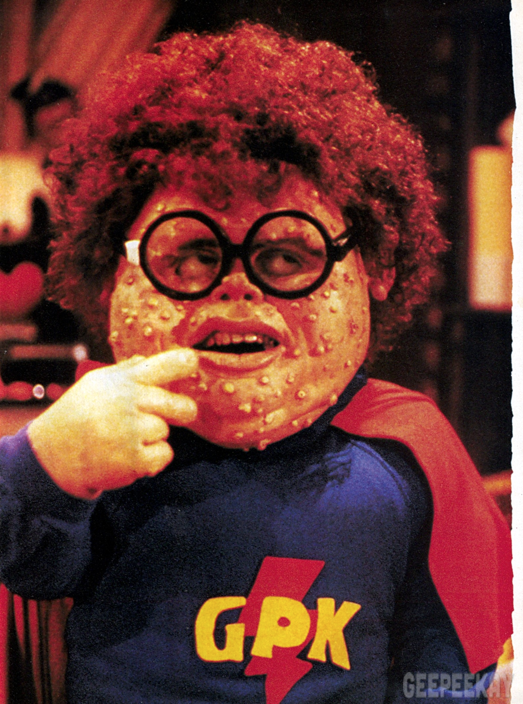 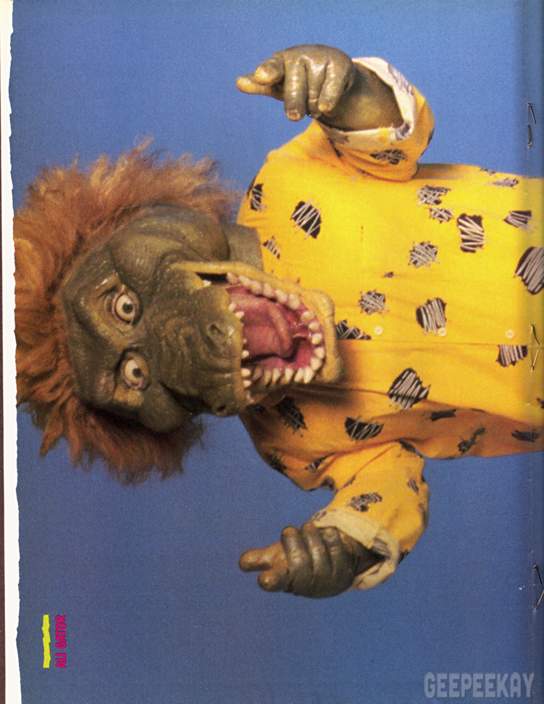 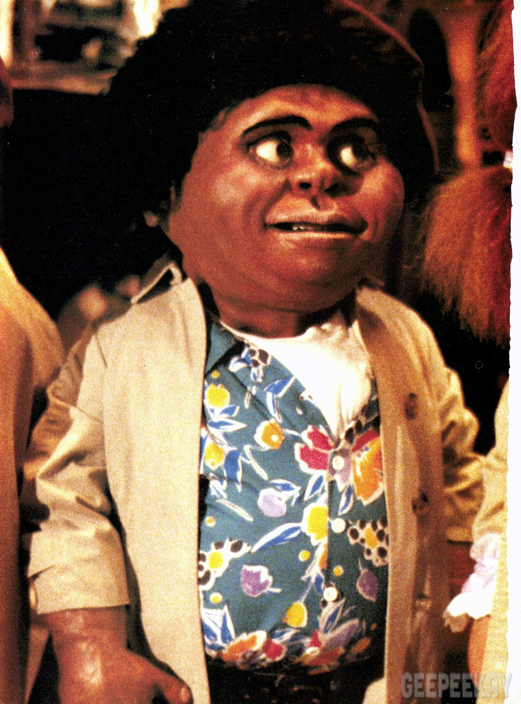 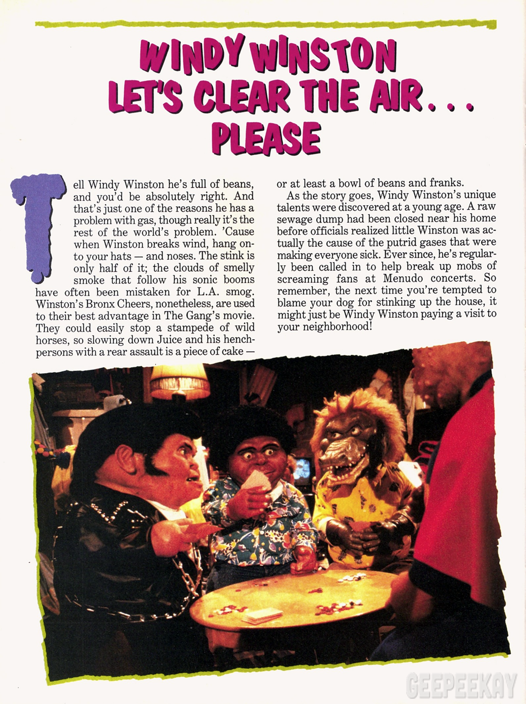 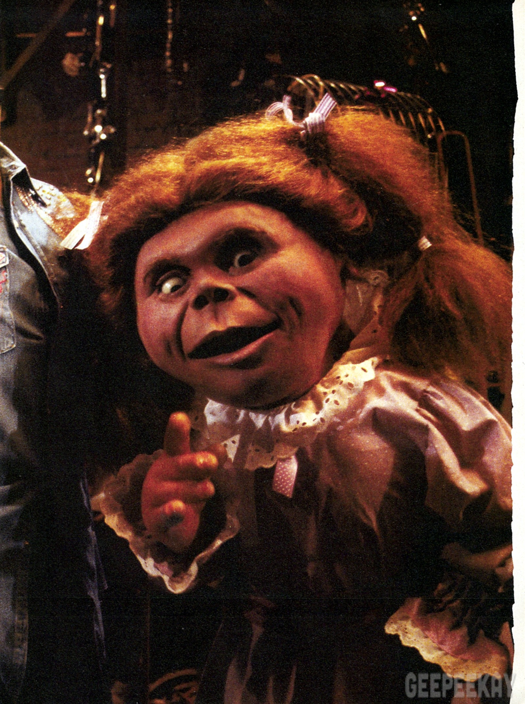 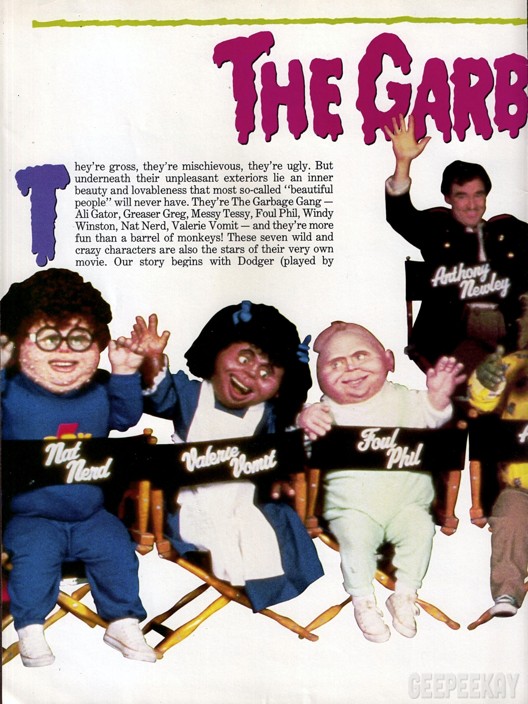 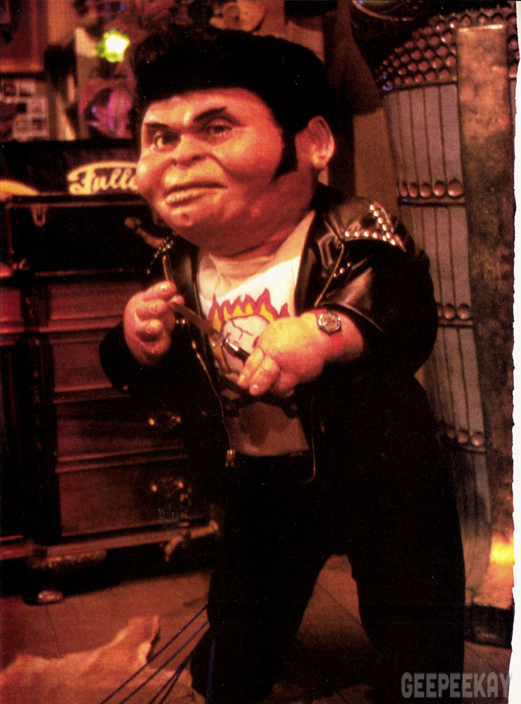 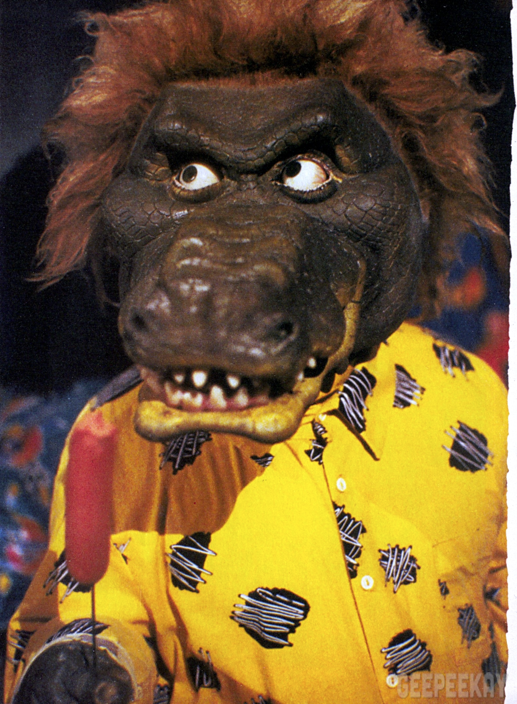 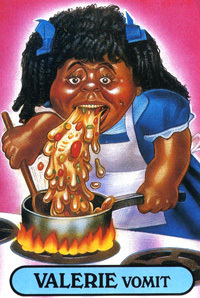 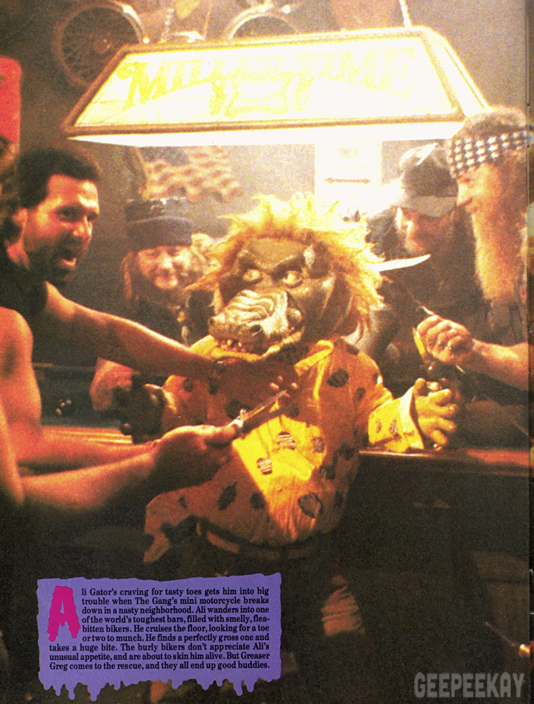 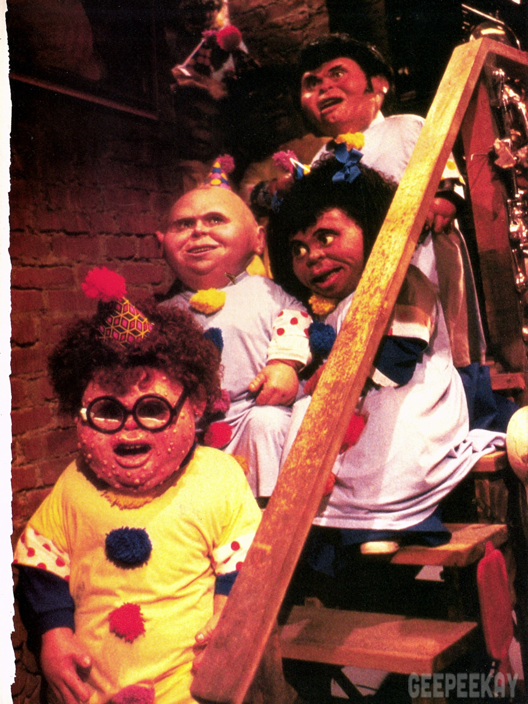 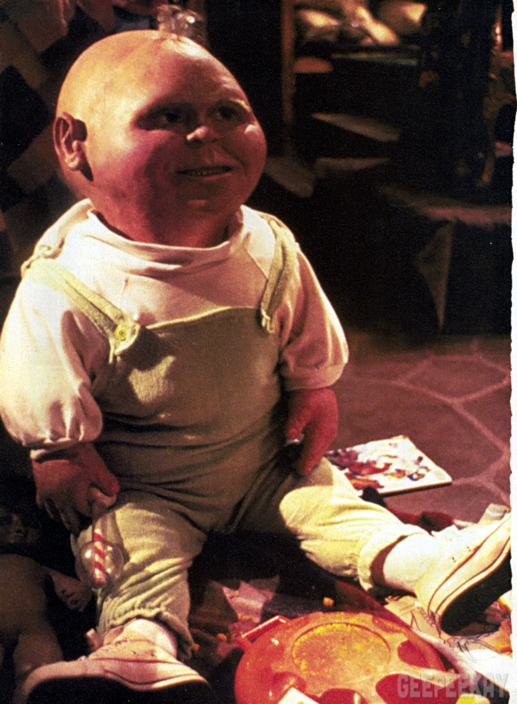 To help promote the release of the film, many cinemas around the country worked together with Topps to distribute a set of 4 Garbage Pail Kids 'postcards' themed after the characters in the movie. 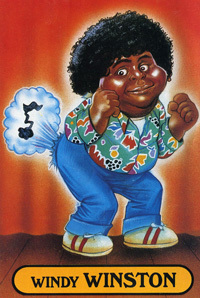 These cards were made of rather flimsy paper material and were not stickers like official Garbage Pail Kids. 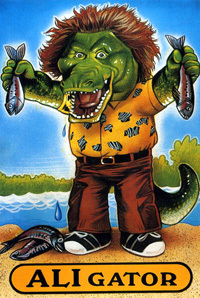 Also, the art on the card was re-worked to look a little more like the character portrayed in the movie as opposed to an exact replica of the card image. 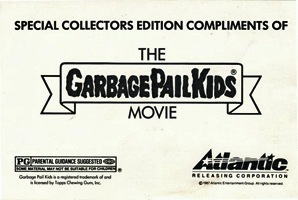 The back of the postcards contained some promotional information and copyright text. 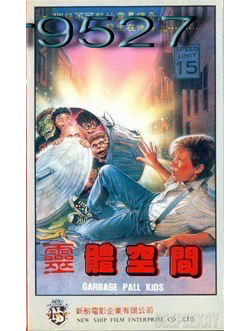 I obtained these postcards first-hand when I viewed the movie back in 1987 and they have been part of my collection ever since. 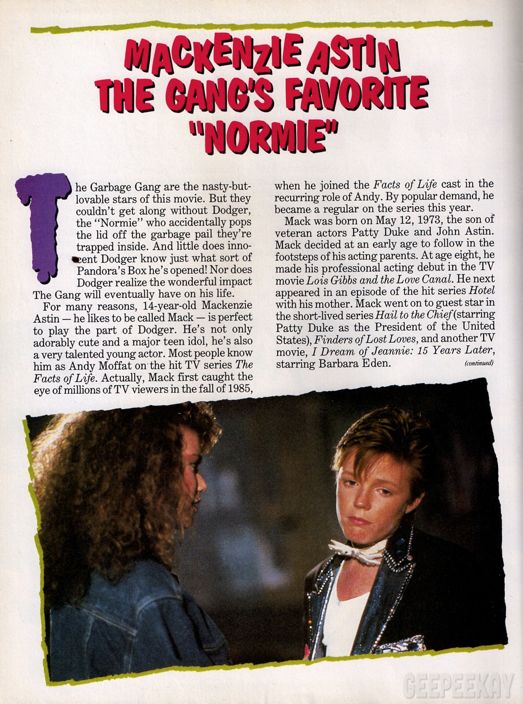 To further hype this glorious achievement in cinema Paramount released an 'Official Movie Magazine'. 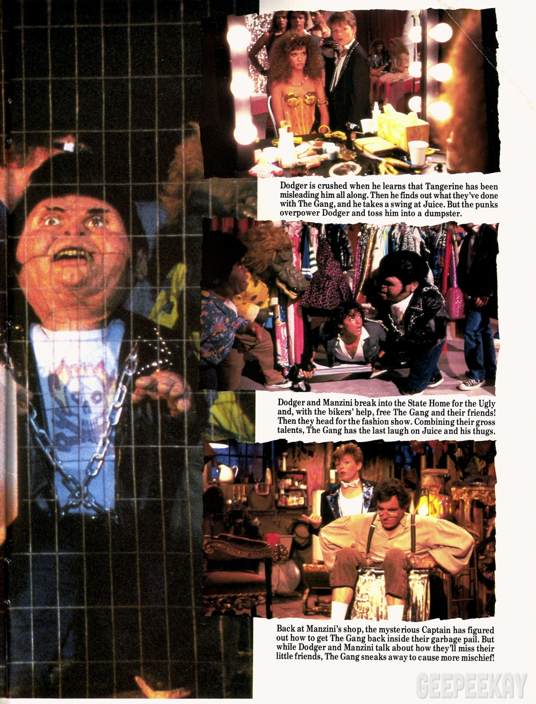 Reminiscent of a lot of the teen magazines of the 80s, this magazine contained lots of pictures, pin-ups, fold-out posters, and a movie synopsis. 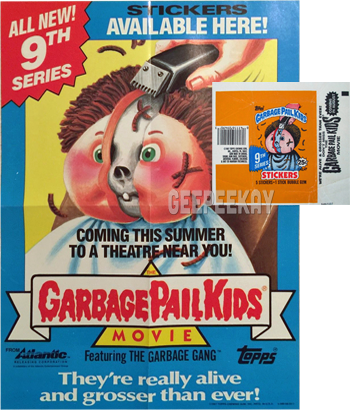 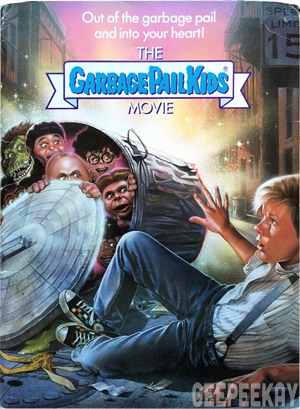 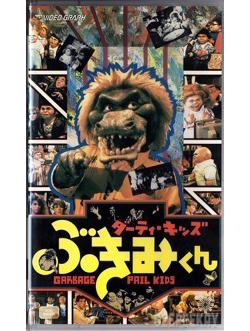 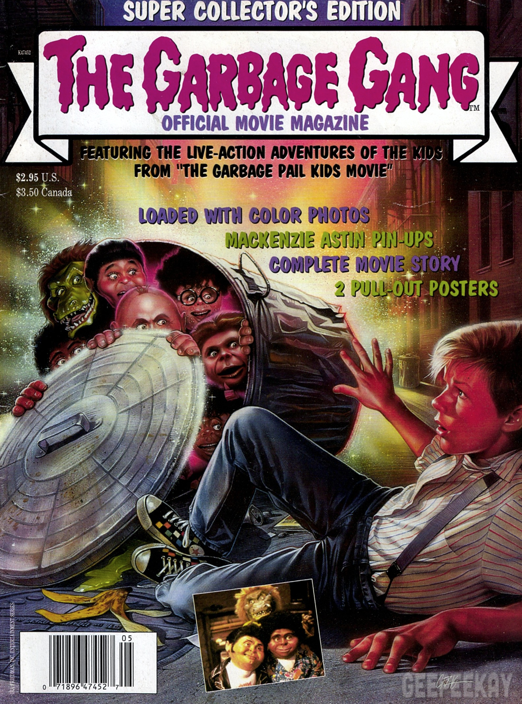 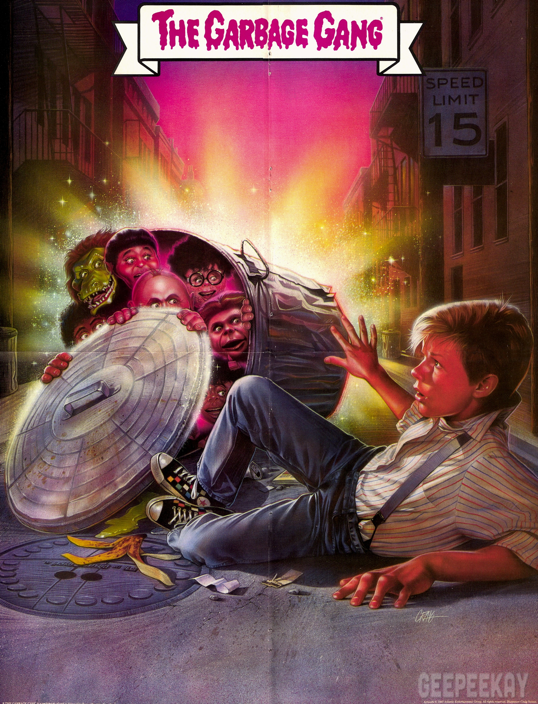 Oddly enough it contained the "Garbage Gang" logo as opposed to the Garbage Pail Kids which graced movie posters and the collectible stickers. 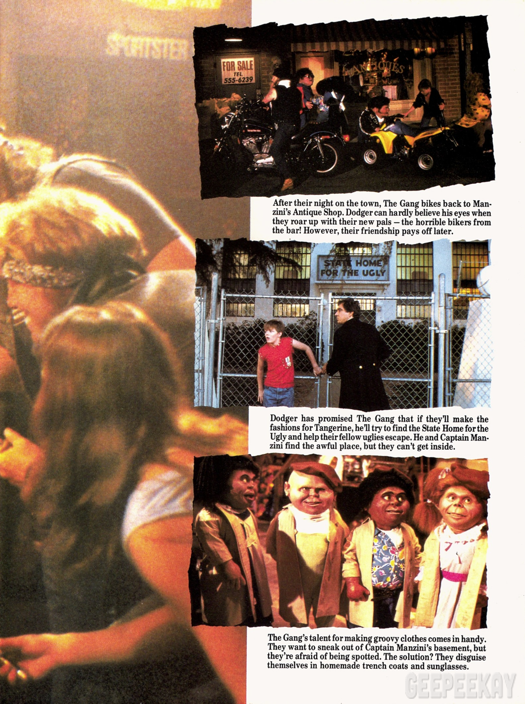 You can flip through the pages of the entire magazine below...read all the articles, see all the pictures, and even see what the posters looked like! 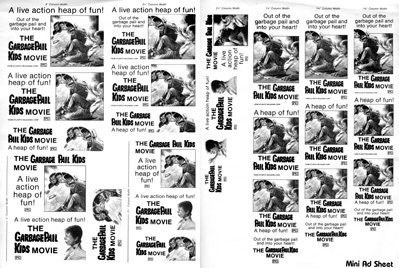 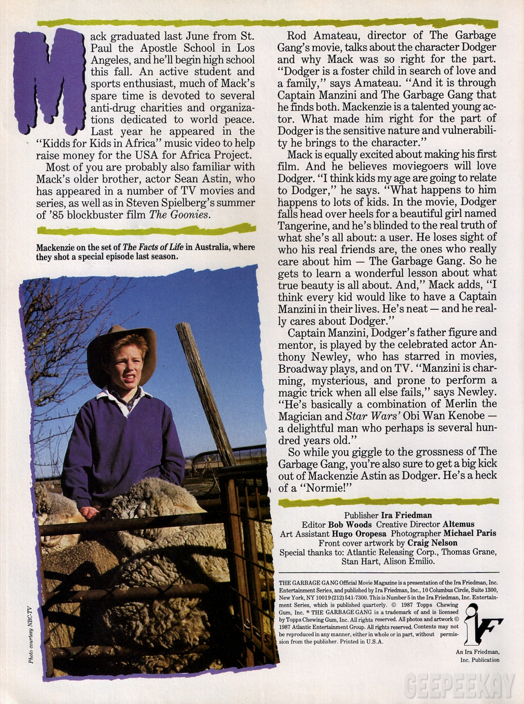 In addition to advertising the movie on their own product, Topps also put forth an effort to get the word out to as many people as possible, and decided to advertise their movie release in a number of different publications. 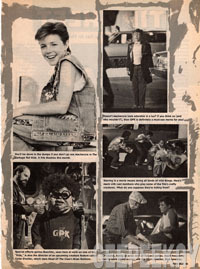 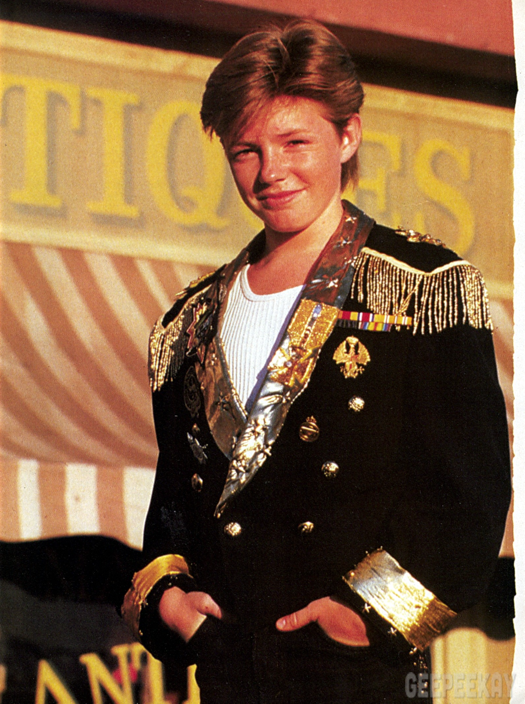 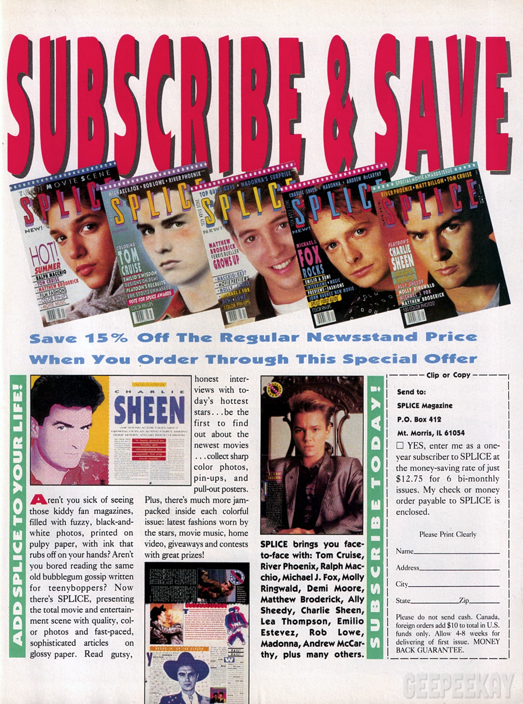 Below is a selection of different ads, interviews, and articles that appeared in magazines, newspapers, and catalogs. 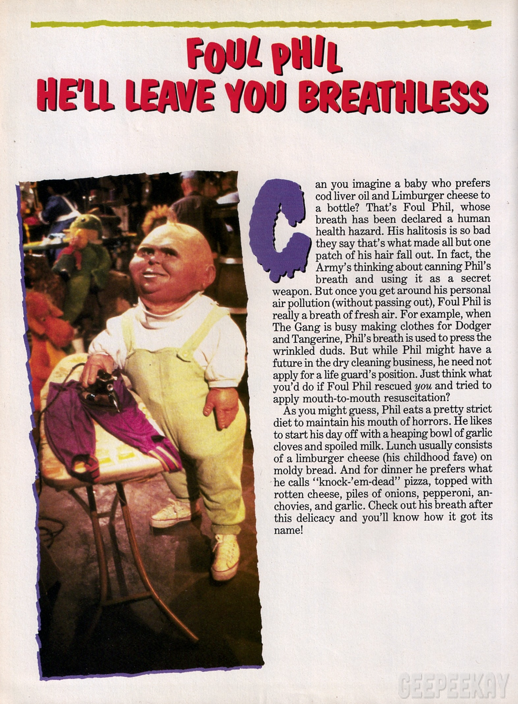 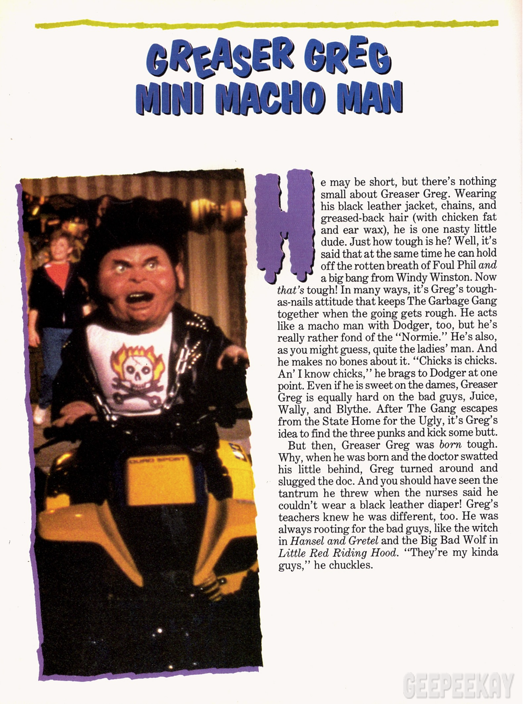 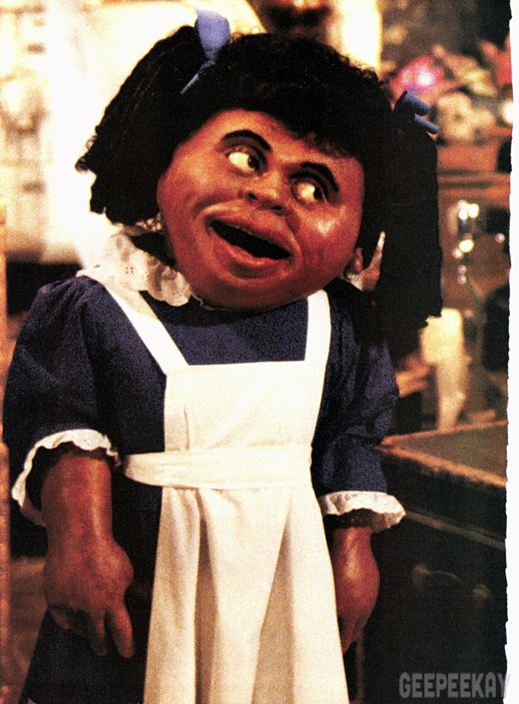 Below is a rather unique item that dealt with the promotion of the GPK Movie...the 'mini ad-sheet'. 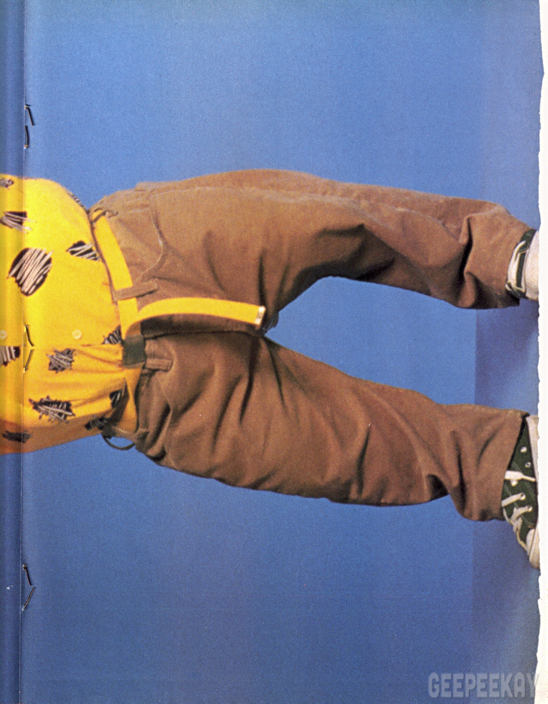 This un-cut sheet measures 11" x 17" and features 24 different 'mini-ads' of varying sizes. 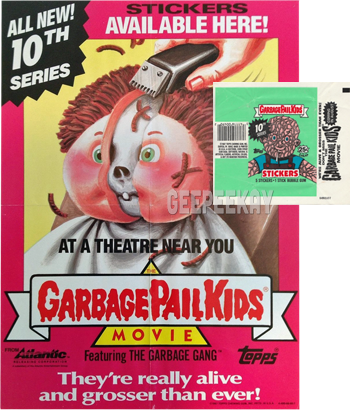 These ads were used on the back of movie tickets to promote the GPK Movie. 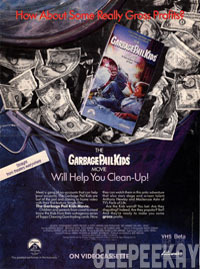 There are numerous different sizes of the ads - this is due to the vast range of movie ticket sizes. 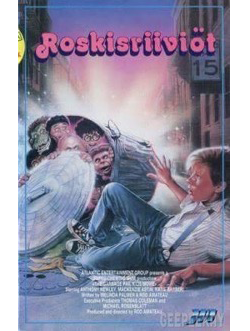 Perhaps the best (and definitely the BIGGEST!) 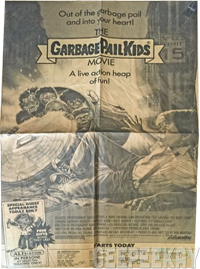 promotional material for the Garbage Pail Kids Movie came in the form of a giant billboard. 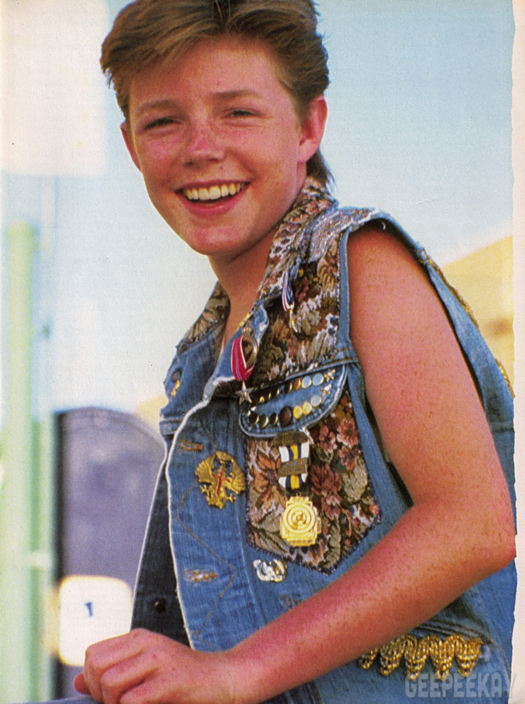 This image (cropped) was taken in California and shared by Mark Newgarden in an interview posted in 2016. 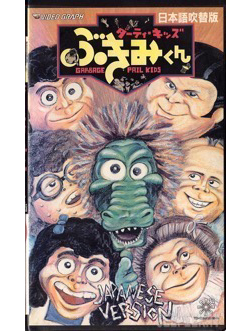 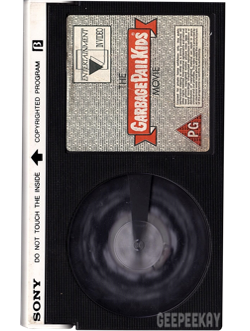 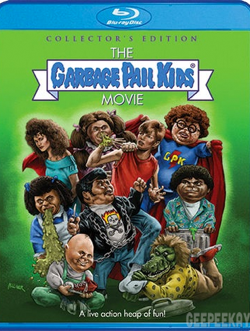 Over the years the Garbage Pail Kids Movie has been packaged in a variety of formats, including a number of different covers from various countries around the world. 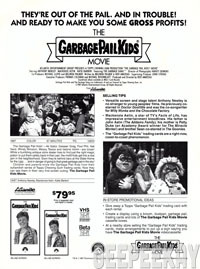 Below is an example of the number of different options available to collect.